For centuries, Spanish colonial coins circulated in the Americas. The primary Spanish silver coin, the Eight Reales, served as the model for the U.S. silver dollar as the Mint Act of 1792 was being drafted, in terms of size and silver content. Another Spanish coin, the smaller Two Reales, also called "two bits" in American vernacular, contained about 25 cents worth of silver and circulated readily alongside the Eight Reales. In 1796, the United States began minting the Quarter dollar, with the idea that it would replace the Two Reales coin. 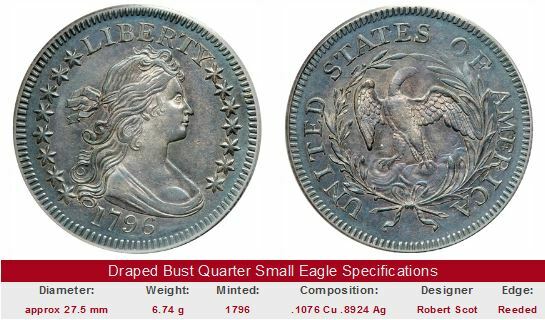 As was the standard for all U.S. silver coins that year, the 1796 quarter carried the Draped Bust design, as seen directly below. The reverse side featured a small eagle atop a cloud. 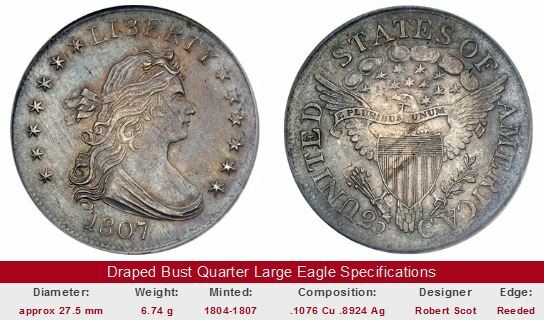 A stunning example of the 1796 Draped Bust Quarter in MS-63 with beautiful toning appears on our home page. The Lewis and Clark Expedition took place from May 1804 to September 1806. Meriwether Lewis, William Clark, and their band of explorers returned with important information about the U.S. territory gained from the Louisiana Purchase, including reports on the inhabitants of the land, its rivers and mountains, plants and animals. The expedition made a major contribution to mapping the North American continent. 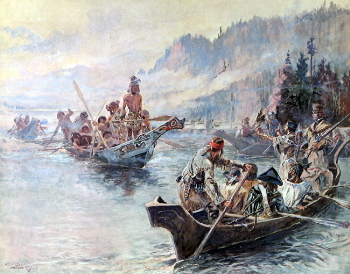 The above is a painting by Charles M. Russell, depicting the expedition on the Columbia River. For a while, however, the Two Reales won out. Faced with perennial budgetary constraints, the fledgling Mint decided that since the Two Reales already circulated in appreciable quantities, there was no need to spend scarce resources to make additional 25 cent coins. Consequently, no more quarters were issued by the United States until 1804. The 1804 Quarter featured the same Draped Bust design, but the reverse was dominated by a larger eagle, with the Great Seal of the United States emblazoned across its chest. This "heraldic" eagle suggested power and strength, an image the American people found more acceptable than its wimpy predecessor. The final year of the Draped Bust Quarter was 1807, followed by an eight year absence of quarter production. The Capped Bust Quarter first appeared in 1815. 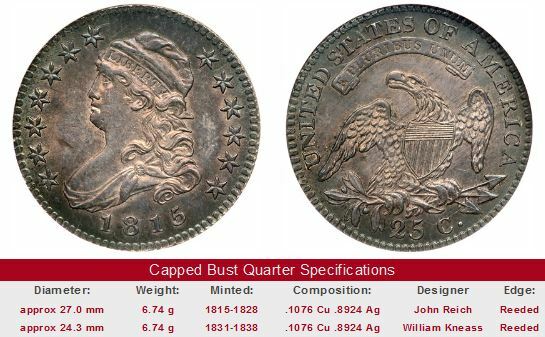 Since it was the practice of the Mint that one design be used for all coins of the same metal, it was predetermined the new quarter would carry the Capped Bust design as did the Half Dollar, which had been in production since 1807. Capped Bust Quarters were minted until 1838. As is always true when searching rare coins for sale, don't buy these Early Quarters unless they've been certified by PCGS, NGC, ANACS, or ICG, or are being sold by a reputable dealer.